Heard of Kathy Cross, a New Zealander. !! Andrew Barron "Andy" Murray, in news is a Scottish professional tennis player, ranked World No. 5 and British No. 1. He is the current holder of the Wimbledon Championships singles title, and is the 2012 Olympic tennis men's singles champion. In 2013, Murray became the 6th man in tennis history to have won over $30,000,000 in career prize money. Andy Murray is on track to do well at Wimbledon despite the deflating way in which his French Open ended. Murray had impressed on his way to the semi-finals for only the second time at Roland Garros only to suffer his worst ever grand slam defeat at the hands of Rafael Nadal. The Spaniard, took just an hour and 40 minutes to win 6-3 6-2 6-1, Murray winning only 10 points on Nadal's serve in the match. Back home, Andy Murray made a comfortable start to the grass-court season in front of new coach…………. as he beat Paul-Henri Mathieu in straight sets at the AEGON Championships. The Brit took one hour and 26 minutes to beat French world 92 Mathieu 6-4, 6-4 in his first match at the Queen's Club as he prepares for the defence of his Wimbledon title. His new coach was discreetly seated a few rows back ….. and this is hailed in Sports circles as a path-breaking move in a remarkable career in which the 27-year-old Scot has often shown the propensity to break new ground. He took on Ivan Lendl when the great Czech had minimal coaching experience, and set a trend that many of his rivals would follow for big-name hirings. Ivan Lendl of 1980s was my favourite, who made me cry often … he remained stoic is another matter altogether. With his punishing topspin ground strokes, Lendl won eight Grand Slam singles titles, reached the final of at least one Grand Slam tournament for 11 straight years; advanced to 19 Grand Slam finals - was ranked No. 1 for 270 weeks – had many honours – but never could win a Wimbledon. Lendl had to move away due to back injury – has a relaxed life and is now coaching Andy Murray. It was stated that in matches involving Andy Murray, Lendl would look more like a modern art - with his arms crossed, or his chin resting on his left hand; reserved and serious rarely showing any emotion. 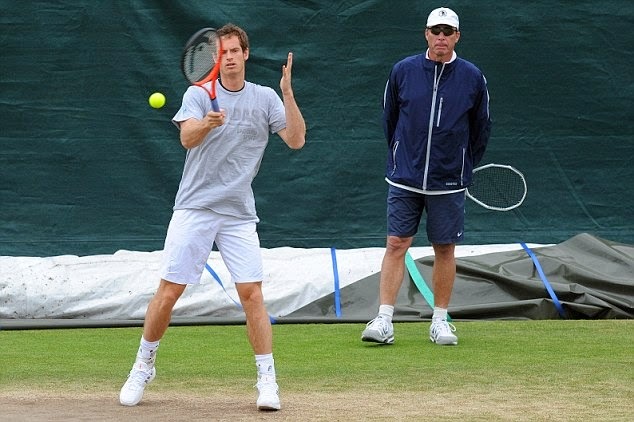 Lendl and Murray broke … Andy now has a new coach…. Australian tennis player Marinko 'Mad Dog' Matosevic slammed the game and said he would never copy Andy Murray, in his new hired coach. Matosevic, who is world No.60, beat ninth-seed Croatian Marin Cilic in an opening-round 6-4 6-4 upset win at the Queen's Club Aegon Championship in London on Tuesday. If you are wondering what the hype of the new coach is all about – it did raise many eyebrows when Andy Murray announced Amelie Mauresmo as his new coach on Sunday, ahead of his Wimbledon defence later this month; he immediately got down to business practising at Queen’s Club under the watchful eyes of the coach. Amelie Mauresmo won the women's singles title at Wimbledon and Australian Open in 2006 and as a grass court specialist is seen as the ideal coach to help Murray retain the Wimbledon crown he memorably won last year after defeating Novak Djokovic. Mauresmo has experience of what it is like to be a woman in this particular man’s world. She coached Frenchman Michael Llodra during the 2010 grass-court season, when he won the Eastbourne ATP event. She is currently captain of the French Fed Cup team (the opposite number of Judy Murray with the Great Britain team) and was on the support staff of Marion Bartoli when she won Wimbledon last year. Last year when Murray won, there was the woman who started playing at age of 16, entered the fray in the start of this century; did not do much thereafter; was seeded 15th ats Wimbledon; defeated Elina Svitolina in 1st round; Christina McHale; Camila Giorgi; and Karin Knapp in the fourth. Sloane Stephens in QF , in Semis No.20 seed Kirsten Flipkens and in the final she defeated No.23 seed Sabine Lisicki. She did not drop a set the entire tournament. She also became the female player who participated in the most Grand Slam tournaments before winning one, as this was her 47th tournament ~ known for her unorthodox and intense style of play it was Marion Bartoli, who was then coached by Amelie Mauresmo. Getting back to the Q at the start, in the game of Cricket, it is the Gentlemen in the middle with white coats with authority to decide – the finger going up, signalling or ordering the batsmen to trudge back towards the pavilion. In the ICC Women’s World Cup India 2013, Kathy Cross from New Zealand, was the only female umpire officiating alongside umpires from the Emirates International Panel of ICC Umpires and the Associate and Affiliate Panel of ICC Umpires.